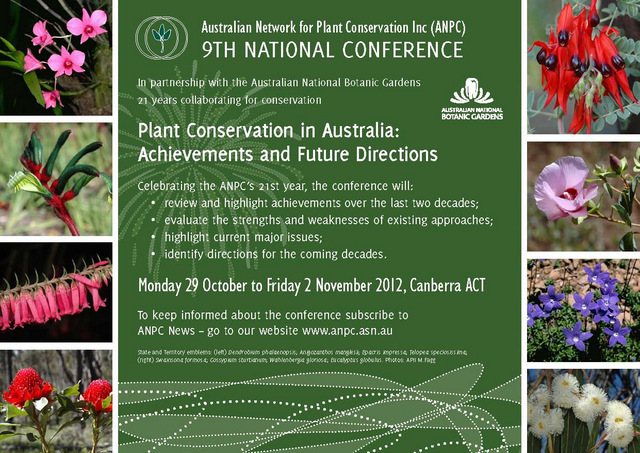 Registration has opened for ANPC’s 9th National Conference to be held 29 October – 2 November 2012 in Canberra. Abstracts are now invited for conference presentations and posters. Abstracts should address a theme of the conference. Closing date for abstract submission is 17 August 2012. Further on abstract submission can be found here. Would you like to run a conference workshop? Day three of the conference is dedicated to workshops. Topics covered by previous conference workshops include: Using interactive identification keys; Seeds: from collection to germination; Conservation on private land; and Fundraising skills for small conservation groups. To request a workshop on a particular theme or apply to run a workshop, please complete section 3 of the Abstract and Workshop Submission form (which can be found here) and submit by 17 August 2012. Are you a regular social media user? ANPC is seeking a Volunteer Social Media Coordinator to manage Facebook and Twitter accounts for the ANPC. To apply please email an expression of interest, outlining your experience in social media, to anpc@anpc.asn.au by Monday 25th June 2012. The successful applicant will receive a free annual membership to the ANPC. ANPC members will have received issue 20 (4) of Australasian Plant Conservation by now. The theme of the latest issue is monitoring and community involvement. Could crowdsourcing be used to detect and monitor invasives? Regular features include: updates from the New Zealand Plant Conservation Network, book reviews, information resources and useful websites, and research roundup. Not a member and interested in becoming one? Visit our membership page. As part of our 21st anniversary celebrations, the ANPC is collating images from the past 21 years. Volunteer Mark Grahame has been uploading photographs to ANPC’s Flickr photo sharing page. A common theme in the images is the ‘hands-on’ nature of our forums and workshops. Here are a few ‘hands-on’ images from past ANPC events. 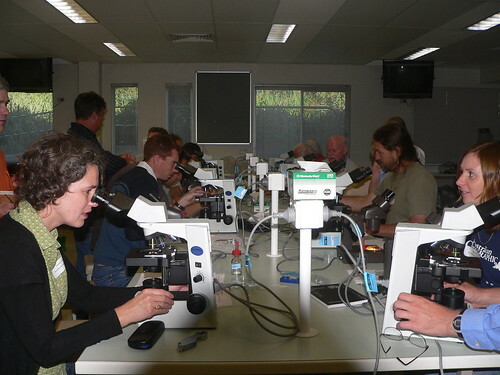 Lichen identification workshop, Forum: What lies beneath? The role of soil biota in the health and rehabilitation of native vegetation, Canberra, ACT, 17-19 April, 2007. Dr Kingsley Dixon conducting a seed dormancy workshop, 5th National Conference, Recovery: A Decade Towards a Biodiverse Future, Geelong from 24 February to 1 March 2003. Collecting vegetation monitoring data, Jewels in the Landscape. 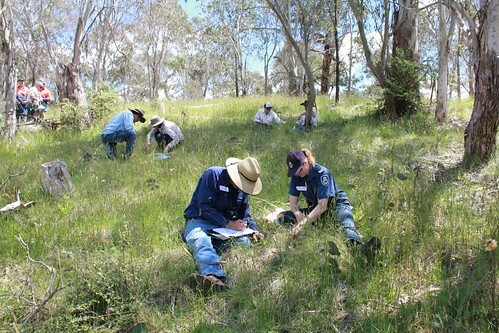 A two day workshop on managing significant native vegetation remnants, 3 and 4 November 2011, Guyra, NSW. Do you have any images of past ANPC activities that you are willing to share? If so, please contact the ANPC National Office. The introduced plant disease Myrtle Rust has now naturalised in a number of areas in North Queensland. In the world heritage-listed Wet Tropics, Myrtle Rust has been found in ‘wild’ situations in the Mossman Gorge section of Daintree National Park, Barron Gorge and Kuranda National Park, at Smithfield Conservation Park near Cairns, and in a residential garden in Mareeba. Further south, it has now also been found in Mackay. The previous northern limit for naturalised occurrence was Yeppoon. North Queensland has a large number of potentially susceptible species within the moist climatic zone favoured by the Rust. Myrtle rust was first detected in Australia in April 2010 on the NSW Central Coast. It has since spread to affect a wide range of species in the Myrtaceae family including Australian natives such as eucalypts (Eucalyptus, Corymbia and Angophora spp. ), bottle brush and paperbark (Callistemon and Melaleuca spp. ), tea tree (Leptospermum spp.) and lilly-pilly (Syzygium spp.). For current Queensland host list, and reporting and management advice, see Queensland Dept of Agriculture Fisheries & Forestry website. A new collaborative project between BGCI and the Botanical Garden of Ghent University, Belgium is aiming to develop a protocol for the genetic management of ex situ plant collections for conservation and restoration. The project will focus on selected species of three unrelated Angiosperm groups: Hydrangea, Magnolia and Cactaceae. The World Flora Online project was recently launched. The Royal Botanic Gardens Kew, the Royal Botanic Garden Edinburgh, The New York Botanical Garden and the Missouri Botanical Garden, have announced plans to develop the World Flora—the first modern, online catalogue of the world’s plants—to be made available by the year 2020. This massive undertaking will include the compilation of information on up to 400,000 plant species worldwide. Judy West, executive director of Australian National Botanic Gardens in Canberra, says Australia will be a "major contributor" to the project. "There's about 20,000 species in Australia which is a significant portion of the world's flora," she says. Contributed by Tom May, Royal Botanic Gardens Melbourne. Fungi Festival 2012, recently held in Hobart, Tasmania, combined a two-day Symposium on the Conservation and Management of Fungi, a debate on eating wild fungi and a weekend of forays and workshops. The first day of the Symposium included overviews of the roles of fungi in ecosystems, covering different nutritional groups such as mycorrhizal fungi, lichens, saprotrophs and pathogens. There were also presentations on weedy fungi, managing fire for fungi and vegetation as a surrogate for fungi. Peter Buchanan, representing the newly formed International Society for Fungal Conservation, shared his experiences of promoting the three F’s (Flora, Fauna and Fungi). An overview of fungal conservation in Australia preceded discussion about a strategy for the conservation of Australian fungi. The second day of the Symposium focused on the roles of fungi in soil health, compost and food production as well as practical applications of fungi in areas such as mine site restoration, carbon sequestration, biocontrol and germination of rare orchids. Walter Jehne highlighted how lack of fungi in agricultural systems can lead to a reduction in the nutritional value of food. On Friday evening, the debate on ‘Eating wild fungi: fun or foolhardy’ provided an entertaining mix of opinions about the topic, with audience acclamation supporting the ‘fun’ side. 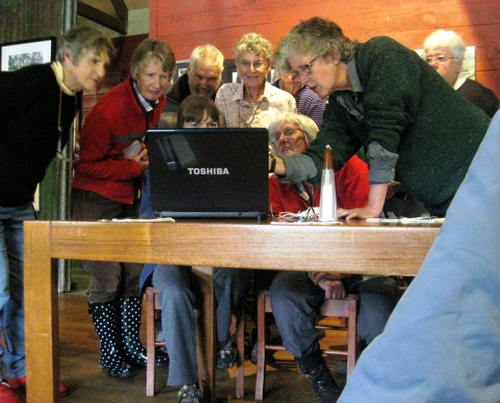 A group of fungi enthusiasts looking at images during Sarah Lloyd’s workshop on slime moulds in the Tarkine Hotel, Corinna. Photo: Tom May. Over the weekend there was a variety of forays and workshops. 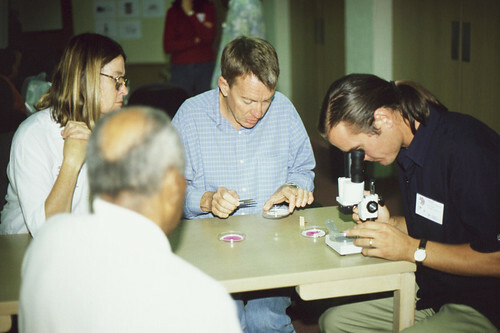 Topics covered included identification of different groups of fungi and techniques for documenting and surveying fungi. There was also a foray for children—with a search for smelly, slimy and tiny fungi! Fungi Festival 2012 was organised by Fungimap and NRM South (the natural resource management agency for southern Tasmania). The success of Fungi Festival 2012, with several hundred participants, suggests that it could become a regular event. In addition to the demand for learning opportunities about fungi, there is certainly scope for further discussions about utilising fungi in restoration, and for connecting researchers and practitioners in this area. This article is an abridged version of a report that will appear in the next edition of Australsian Plant Conservation. The NSW Office of Environment and Heritage has released the Draft strategic directions for horse riding in NSW national parks and reserves, to guide the provision of improved horse riding opportunities. Interested members of the public are invited to make submissions by 30 June 2012. On 10 May 2012 the NSW Minister for the Environment, Robyn Parker MP, announced the start of the statutory review of the BioBanking Scheme. The aim of the review is to identify the strengths and challenges of BioBanking and evaluate ways of improving it to ensure it achieves credible environmental outcomes and is practical to use. Submissions close Monday 9th July 2012. The 2 Million Trees Project will plant 1.5 million trees in parklands and other public open space in metropolitan Melbourne and half a million trees along waterways in regional Victoria. Councils, schools, community and Landcare groups, committees of management and other public land managers are invited to submit tree planting proposals. Applications for Round 1 close 2 July 2012. Members of the Native Orchid Society of South Australia will give a presentation on the diverse range of orchids that occur in the Yorke Peninsula region at a workshop held at Hardwicke Bay on Sunday, June 24 2012. Join Bush Heritage’s Victorian Reserves Manager Jeroen van Veen for an exclusive visit to Nardoo Hills Reserve Sunday 19 August 2012. This 817 ha supports a large diversity of vegetation communities including grey box grassy woodland, box-ironbark and mallee, providing vital habitats for a range of wildlife. For bookings call Fam Charko 04 02519124 or email: bookings (at) iffa (dot) org (dot) au. The National Landcare Conference is being held at the Sydney Convention and Exhibition Centre from 3 to 5 September 2012. This year’s conference will take place in Landcare Week and will be an exciting opportunity to bring together people that are interested in creating sustainable landscapes for the 21st century. Participants from Landcare and community groups, land managers, industry, regional bodies and government representatives are invited to submit abstracts for presentations and posters. The call for abstracts closes on Tuesday 12 June 2012. Early Bird registrations close 1st July. More information available from the conference website. For more information and to register visit the conference webpage.